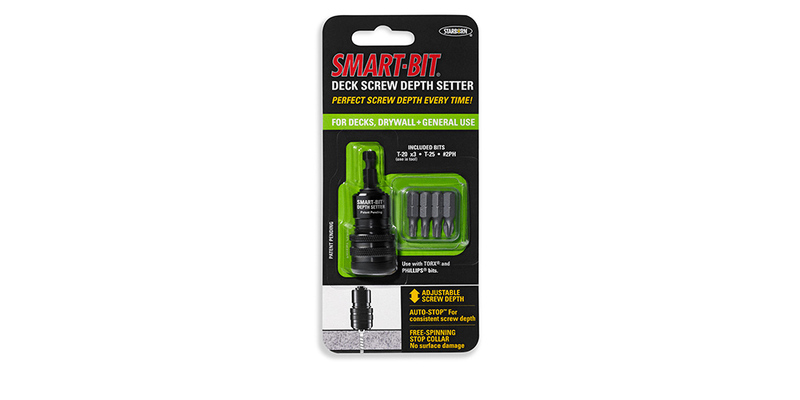 Smart-Bit® Depth Setter | Starborn Industries, Inc.
Smart-Bit® Deck Screw Depth Setter is designed to make fastening decks, drywall, and general screw setting easier and faster, with clean and uniform results: perfectly set screws every time. The tool is adjustable so that it can be used with many different screw types and sizes, and features an Auto-Stop™ mechanism that sets the screw at the target depth without stripping the screw recess. A free spinning stop collar with rubber O-ring protects the work surface from damage or marking. The Depth Setter works with both Phillips® and Torx® bits and is designed for use with a full range of Starborn fasteners. 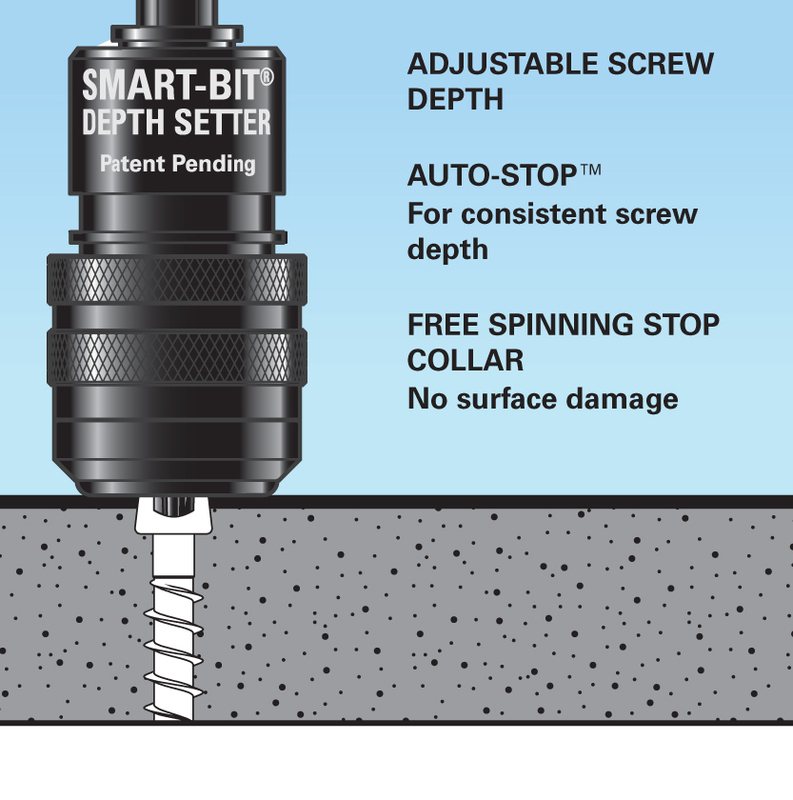 The Depth Setter also works well with other fastener products. Once target depth is reached, the Auto-Stop™ mechanism inside the tool disengages the driver bit and stops the screw from driving further - without stripping the screw recess. Secures the depth setting of the tool for consistent screw depth, every time. Depth can be adjusted for many different types and sizes of screws, and applications. The free spinning stop collar is fitted with a rubber O-ring to prevent damage to the work surface once the target depth is reached. Each tool includes one T-20 bit in the tool and four additional replacement bits: (2) T-20 bits, (1) T-25 and (1) #2 PH. Loosen Locking Ring (2) and set fastener depth by moving the Adjustment Ring (3) to the desired position. The adjustment ring must engage at least two full threads of the tool body. Secure the Adjustment Ring with the Locking Ring (2). To determine the desired screw depth, practice on scrap material. Drill in a straight and stable fashion with a standard drill*. 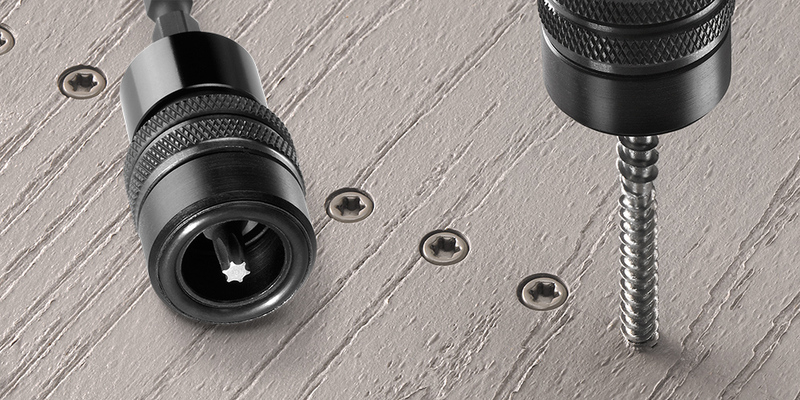 The screw is set when the Auto-Stop™ mechanism engages fully. In most decking materials, the tool makes a clear popping sound when the Auto-Stop™ engages. Disconnect power and retract tool fully; remove bit with pliers. To insert new bit, retract tool fully and insert bit all the way into tool. *Note: Impact drivers may not set screws to the correct depth and may cause the locking ring to come loose. 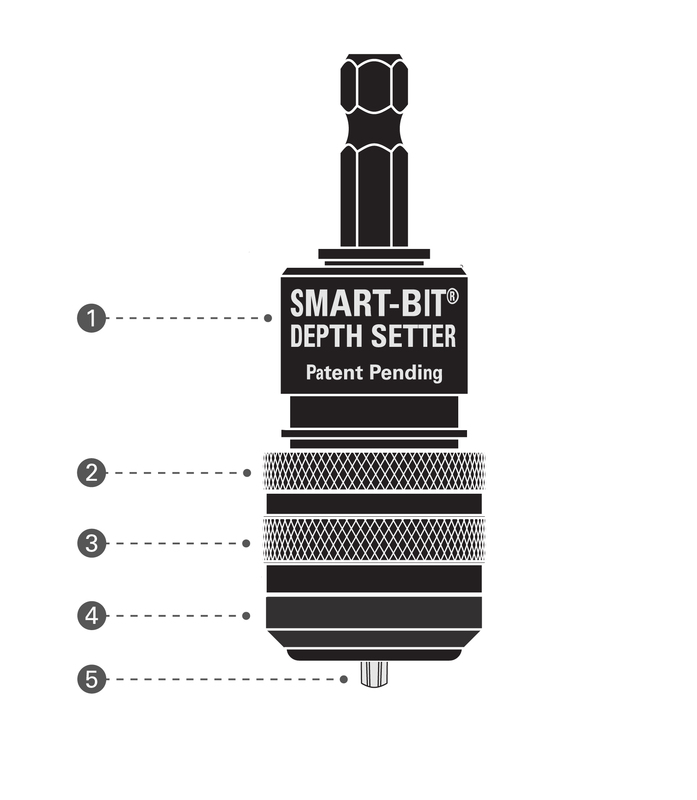 Standard drills are recommended for use with the Smart-Bit Depth Setter.